Austin Forkner wins his fourth main event of the year. 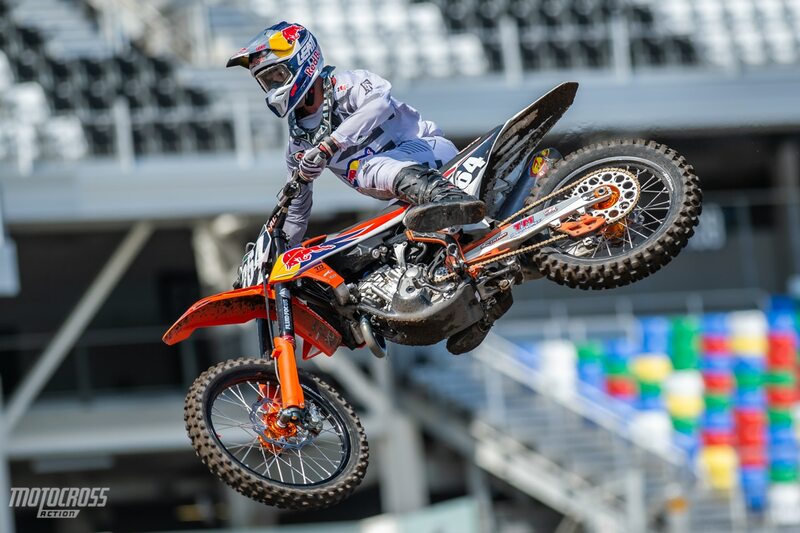 The 2019 Monster Energy Supercross series is in Daytona Beach, Florida for round ten of the season. 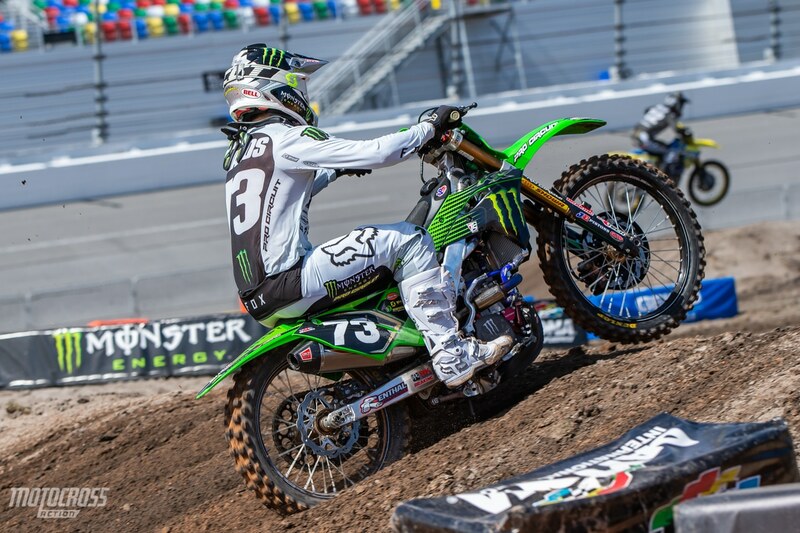 The Daytona Supercross track is being called “The Beast” because it’s so challenging for the riders. The dirt is soft, the rhythm sections are long and the sand is deep today in Daytona. Austin Forkner grabbed the holeshot in the 250 main event, but it was Kyle Peters who did a slingshot move in the sand, around the outside of the second turn to pass for the lead. 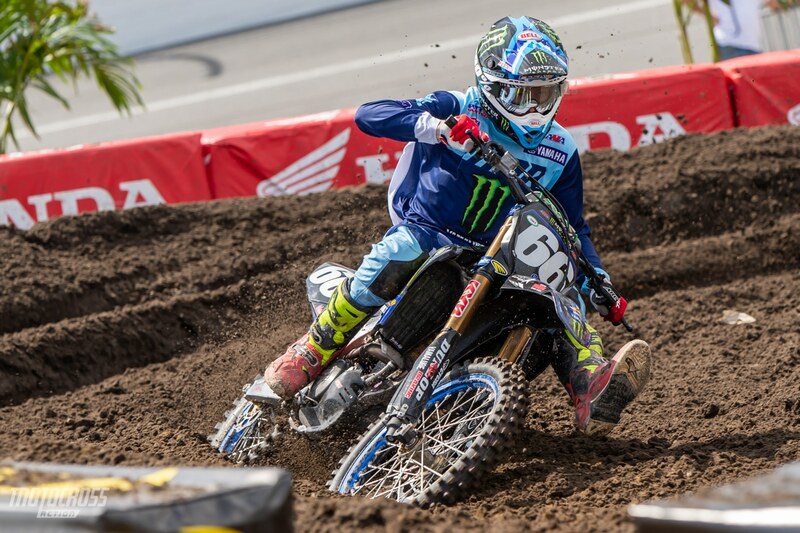 Justin Cooper also got around Forkner in the sand, but he wasn’t able to stay in front of the points leader for long. Kyle Peters was able to hold off the Forkner for three minutes, and with twelve minutes to go Austin Forkner made the move on Peters and the rest was history. Chase Sexton made his way up to second, but he wasn’t quick enough to challenge Forkner tonight. 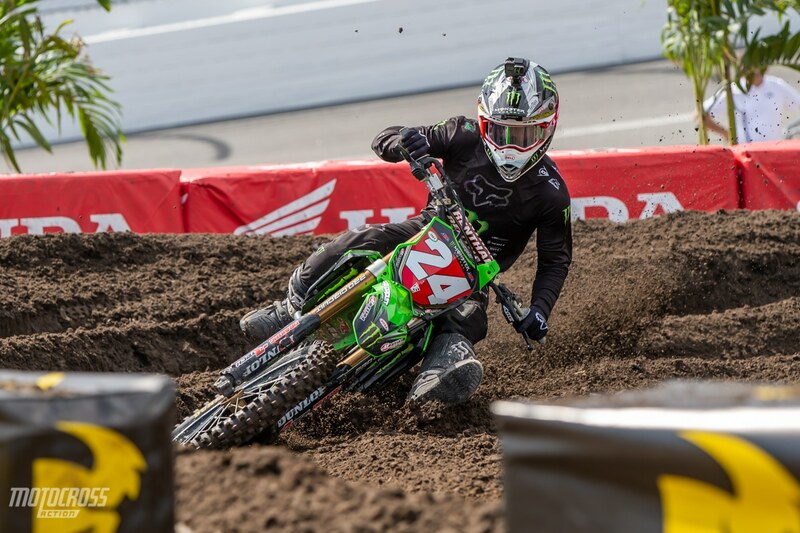 Austin Forkner has won four of the five 250 East Supercross races this year. Chase Sexton is riding great, but he wasn’t able to get beat Forkner tonight. 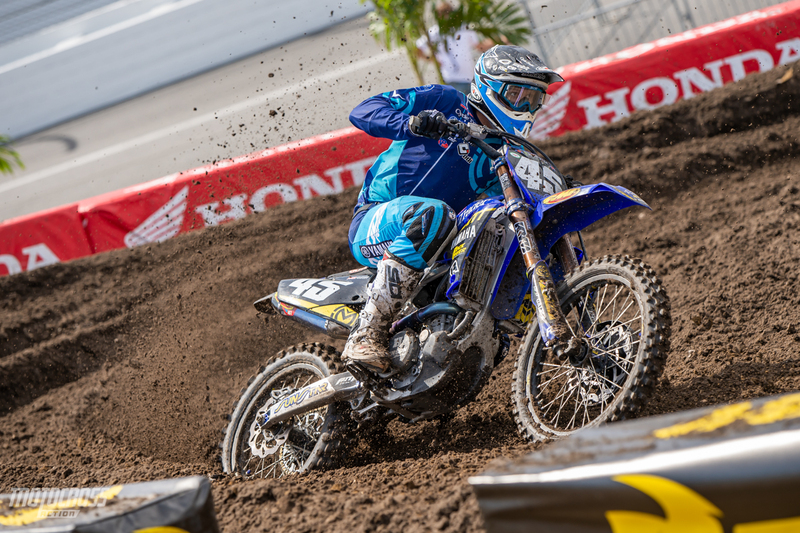 Justin Cooper grabbed another podium with a third place in Daytona. 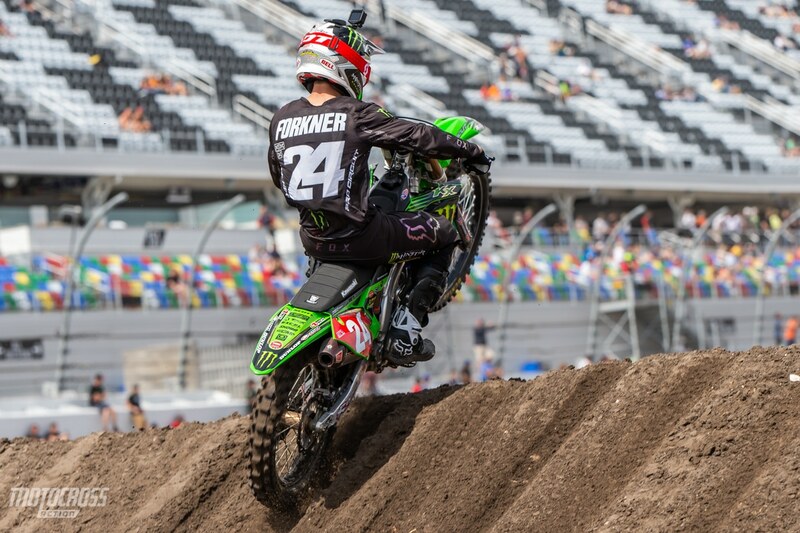 Austin Forkner extended his points lead to 23 points tonight in Daytona. In the 250 LCQ it was Lorenzo Locurcio who grabbed the holeshot, not once but twice! Unfortunately the first race was red flagged because of a crash in the first turn. Lane Shaw tangled his handlebar with another rider’s bars and went down hard. We’re glad to see him get up and wave to the crowd as he was being carted off by the Aplinestars Mobile medical unit. Lorenzo did get out front again after the restart and he went on to win the 250 LCQ. Steven Clark, Tj Albright and Luke Neese rounded out the top four and qualified for the 250 main event. Chase Sexton grabbed the holeshot in the second 250 heat race of the night but he threw it away when he crashed in the second corner. Sexton’s crash turned into a huge pile up for practically the entire pack. 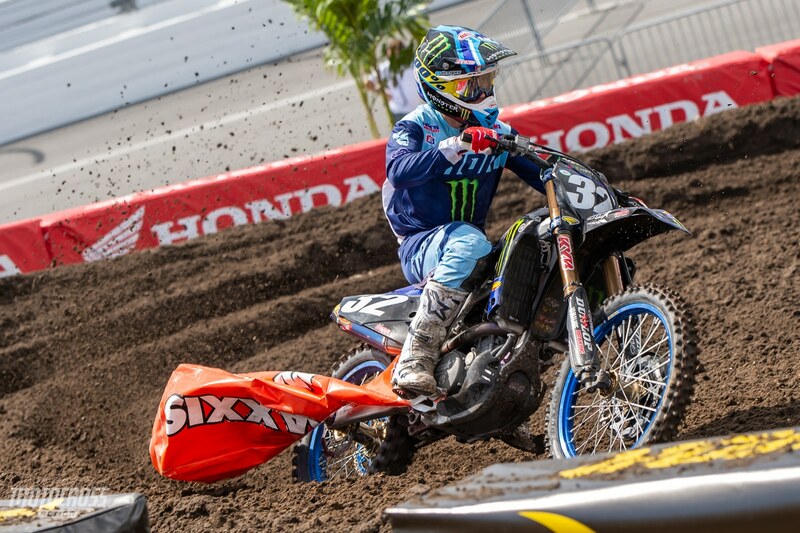 Jordan Bailey was one of the only riders to make it through the second turn with no issues, he railed around the outside and took the early lead for the first time in his rookie Supercross season. Jordan led for the first lap before Justin Cooper made the pass on the Orlando, Florida native. Justin Cooper went on to win his first Supercross heat race of his young career with Jordan Bailey finishing second and Brandon Hartranft third. Chase Sexton got up quickly from his crash in turn two and put on a charge. He fought his way through the pack to finish fourth, right behind Hartranft and Bailey at the finish. 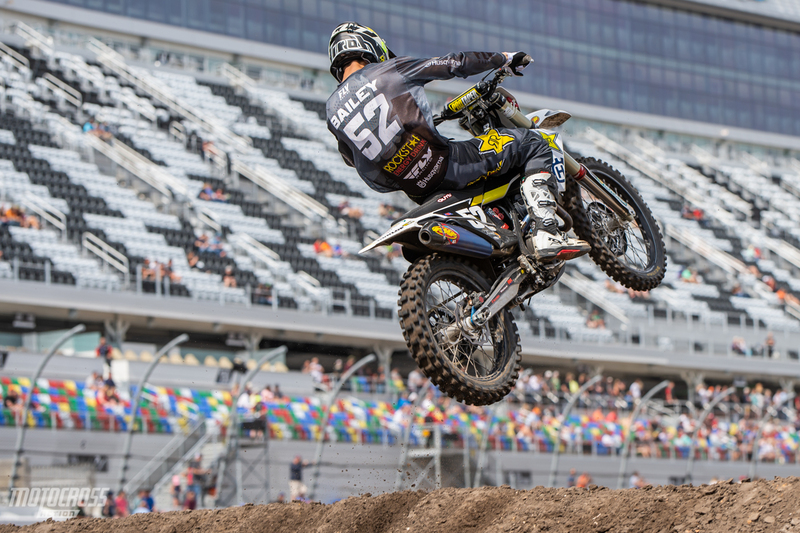 The Supercross rookie Jordan Bailey grew up near by in Orlando, Florida and we’re guessing he’s very happy with his first heat race at his hometown race. Jordan led the race early and ended up finishing second to Justin Cooper. Chase Sexton had the holeshot, but a crash in the second turn made the heat race a lot tougher on the young Geico rider. He came from the back to finish fourth. Brandon Hartranft looks great in Daytona, he finished third in the second 250 heat of the night. In the first 250 heat race it was Austin Forkner who grabbed the holeshot and pulled away. Austin wasn’t the fastest in qualifying, but he sure does look good today, he even looked over at the crowd while mid-air in the rhythm section. Alex Martin passed Mitchell Oldenburg to finish second in the heat with Mitchell third. Kyle Peters finished fourth and Jace Owen finished fifth. 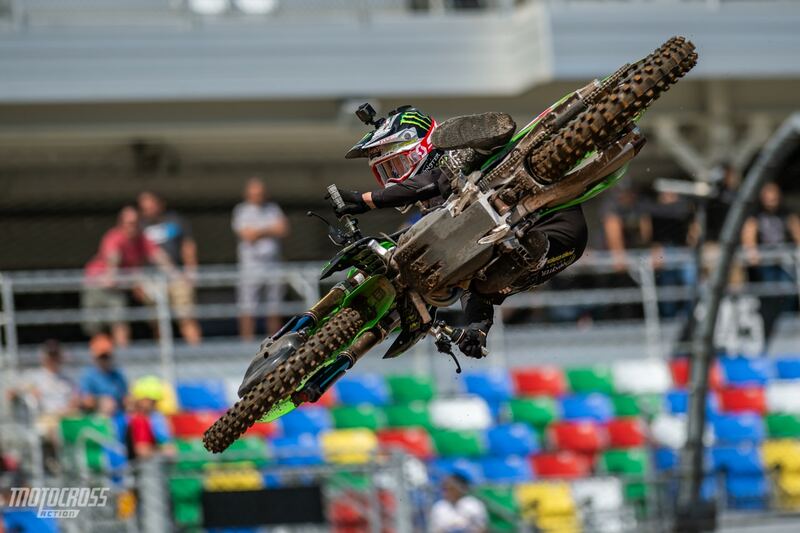 Austin Forkner is on fire today in Daytona. 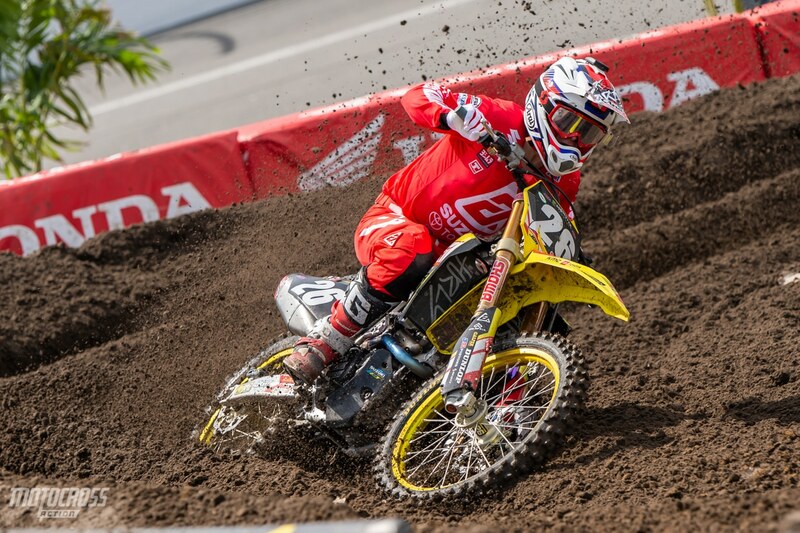 Alex Martin is looking fast in Daytona. He made his way up to second in the first heat. Mitchell Oldenburg finished third in the first 250 heat race. Qualifying is over with for the 250 class at the Daytona International Speedway. Austin Forkner has been dominating the 250 East division, but with a wild card track like Daytona, anything can happen. Chase Sexton qualified first in the 250 class with Austin Forkner qualifying second, only 0.06 behind Chase. Justin Cooper looks good as well, he qualified with a 1.10.1. Check back in with MXA throughout the day for qualifying results, heat race and main event results, news and photos from round ten of the 2019 Monster Energy Supercross season. Chase Sexton is looking good today in Daytona, after qualifying first Chase is looking to get his first Supercross win as a Pro. 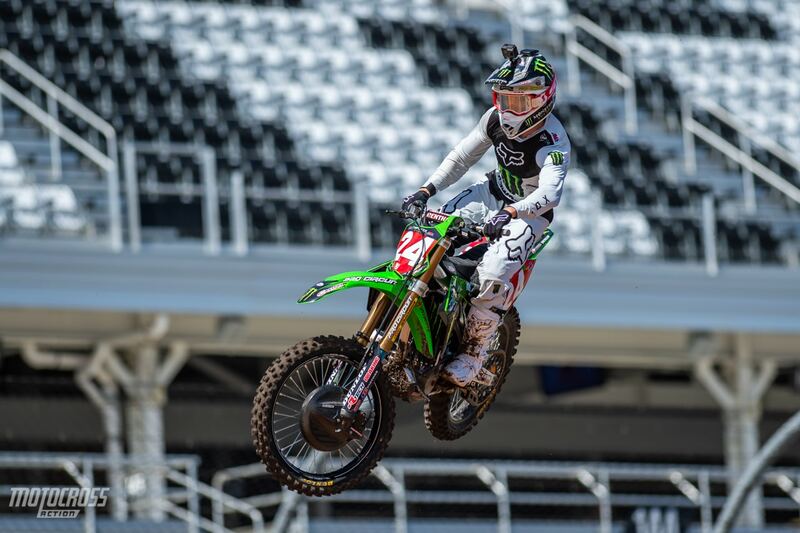 Austin Forkner looks confident and extremely fast in Daytona, but it wasn’t quite enough to score the pole position. He qualified second 0.06 behind Chase Sexton. Justin Cooper caught his foot peg on a tough block cover and carried it around the track with him. He’s riding good in Daytona, he qualified third. Austin Forkner throws some style to show everyone he’s feeling good. Alex Martin blasts through the soft white sand, he qualified sixth. Qualifying is underway at the Daytona International Speedway. Austin Forkner has been dominating the 250 East division, but with a wild card track like Daytona, anything can happen. Chase Sexton qualified first in 250 qualifying session 1. Justin Cooper was second, 0.7 behind him and Austin Forkner was third 1.1 behind Sexton. Austin Forkner had a crash in the first qualifying session, but that’s become normal for Austin in 2019. He crashes in qualifying, but pulls it all together during the heat race and main event. Martin Davalos sits 6th in the first session. It’s really cool to see Ryan Sipes racing Supercross again. This time on a KTM 250SXF. Check back in with MXA throughout the day for qualifying results, heat race and main event results, news and photos from round ten of the 2019 Monster Energy Supercross season.